One "bunkhouse" in the Leyte area. It is by definition a temporary shelter, yet individuals have occupied it for years on end. 2013’s Super Typhoon Haiyan left thousands homeless. To meet the need for shelter, relief organization built temporary housing in the towns that were heavily affected by the storm. While some have already received permanent housing, other families continue to wait and hope that their day to move comes soon. While the bunkhouses met the immediate need, they were not designed for prolonged living. Yet two years after the storm, their time to move has still not been granted. The close proximity and shared restrooms, washing areas, and cooking spaces allows for sicknesses to spread easily and rapidly. Many of the children have open wounds, coughs, and skin rashes. One child picked up a dead, fly covered rat and tossed it to the side of the road, and then continued on playing with his friends; it didn’t even cross his mind to wash his hands. But, with their parents working, it leaves many kids unsupervised throughout the day prohibiting them from learning healthy living habits. One school-aged boy said he was unable to attend classes because he had to stay home and watch his younger siblings as his parents were out working whatever jobs they could find. It has been hard for many to find jobs after the storm. Rina Miller takes blood pressure of one of the women living at the bunkhouse. 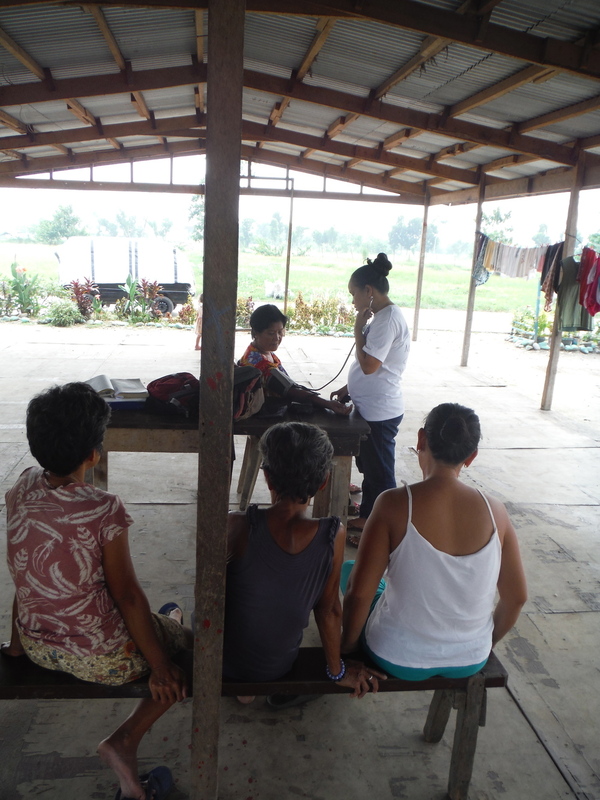 Though a trained social worker, Rina has learned life-saving medical skills necessary in disaster situation. While their time at these bunkhouses is coming to an end, their struggle is not. The search for livelihood will continue as they attempt to set up life in their new homes. The eyes of the world have moved on, as many other internationally renowned natural disasters have captured the media’s attention. But we must not forget that the adverse effects span much longer than the limelight the victims receive for it. Despite assistance from international aid, people’s lives drastically changed, most for the worse, and many will stay that way. For those residing in the bunkhouses in barangay Candahug, Palo, Leyte, we have been trying to make their remaining months at the bunkhouses more bearable by offering various activities. We do a weekly after-school program for the children to give them a structured recreational time along with some lessons in morality. On Fridays, we put on a movie night in the pavilion to help make the environment more family-friendly, so as to combat the all too common seen of men sitting around drinking. One of our hopes for the activities here is to exemplify ways that they can change the atmosphere of their environment and encourage them to work to produce a healthier community. Rina facilitates an educational seminar on the benefits of breastfeeding against formula, a topic she's passionate about and is confident can help the mothers in bunkhouse. The Millers also facilitate an after-school program for the children at the bunkhouse whose parents are often working, or looking for work, well into the night. After a survey, we were able to identify some topics that the mothers thought would be beneficial and practical, and have begun holding educational seminars on those various subjects. Our first discussion was on parenting; the ideas presented opened up a time of dialogue where the older generation was able to express some of their experiences to the younger mothers in the group. Nutrition proved to be a topic of interest as we were able to inform them of the beneficial nutrients they get from eating their local produce and then we contrasted it with the food labels from popular canned foods. Our latest lecture was giving basic health care advice on wound care, coughs, fevers, and high blood pressure. We ended by measuring people’s blood pressure and offering tips on how to lower it. For those with really high blood pressure, we were able to hand out some medicine that was donated by a local clinic. We are thankful to have the opportunity to work and minister amongst these vulnerable residents of Tacloban. The information we are providing and the conversations we are starting are topics they can continue to consider as they move into other environments and seek to maintain the health of their families. We are committed to seeing these people feel a sense of hope as they continue to endure through a very difficult living situation. Educational investment is a powerful tool in moving people towards this sense of empowerment in the midst of bleak environmental situations.